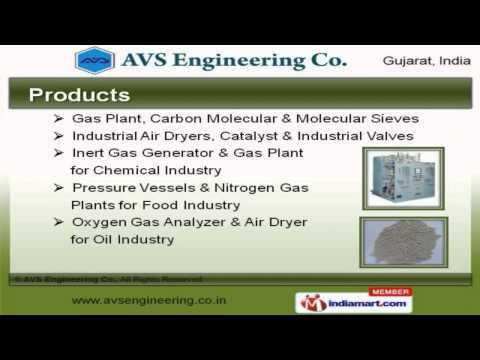 Welcome to AVS Engineering Company, Manufacturer and Exporter of Gas Plant, Generator and Air Dryers. An ISO 9001:2008 certified company, established in 2011 at Vadodara. Our International quality standards and Ethical business policies make us different from others. Assured quality products, Industry leading prices and Customized packaging options are the factors that help us to stay ahead of our competitors. We are engaged in offering supreme quality Industrial Air Dryers, Pressure Vessels and Nitrogen Gas Plants for Food Industry. Gas Plant, Carbon Molecular and Molecular Sieves are best in the industry amongst others. We also provide Industrial Air Dryers, Catalyst and Industrial Valves that are in huge demand across the global markets. Our Inert Gas Generator and Gas Plant for Chemical Industry are cost effective. Our organization is highly involved in providing an impeccable range of Pressure Vessels and Nitrogen Gas Plants for Food Industry. Oxygen Gas Analyzer and Air Dryer for Oil Industry are acknowledged for their functionality.